I teach a STE(A)M Enrichment class for kids age 3 – 6. 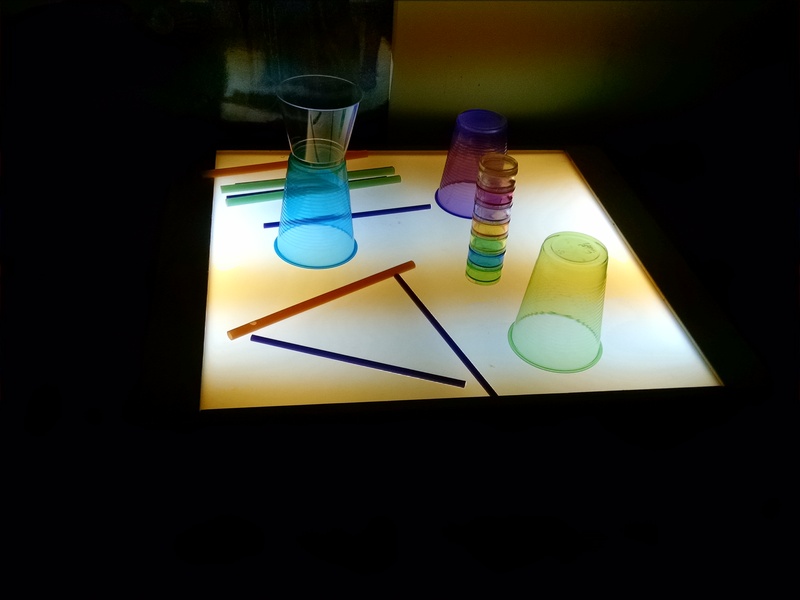 One of the hands-on science classes we teach is about Light and Shadows. All the activities here are also great for a Groundhog Day theme at a preschool or elementary age class. 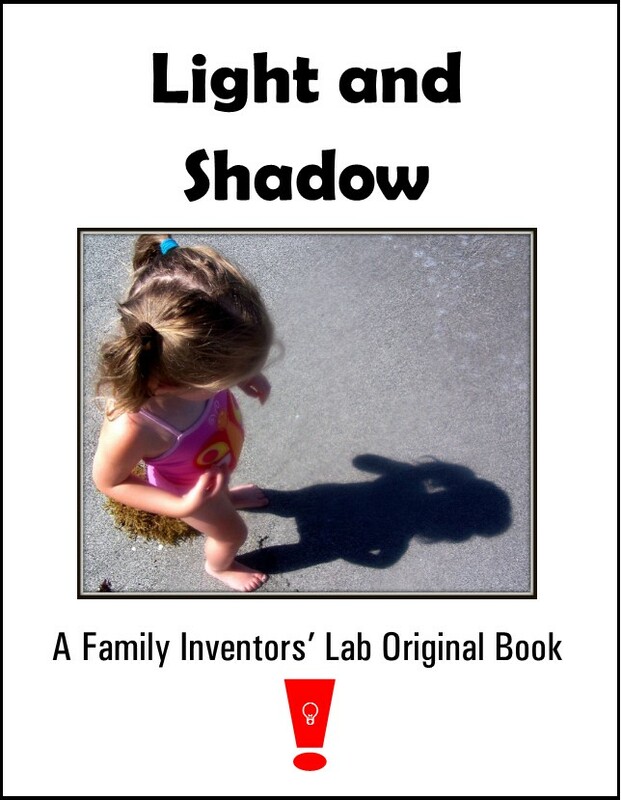 I wrote a kids’ non-fiction book which covers all the key ideas about light and shadow. It includes lots of easy experiments to try. You can read it (or print a copy) here. With our class structure, we begin with “discovery time”, where the kids have an opportunity to explore all the activities hands-on, and start discovering how things work, testing theories, and making observations. This allows questions to naturally arise, raising their curiosity about what’s happening. Then we have opening circle, where we read pages 1 – 10 and 19 – 20 of the book, which explains the phenomena they’d observed. 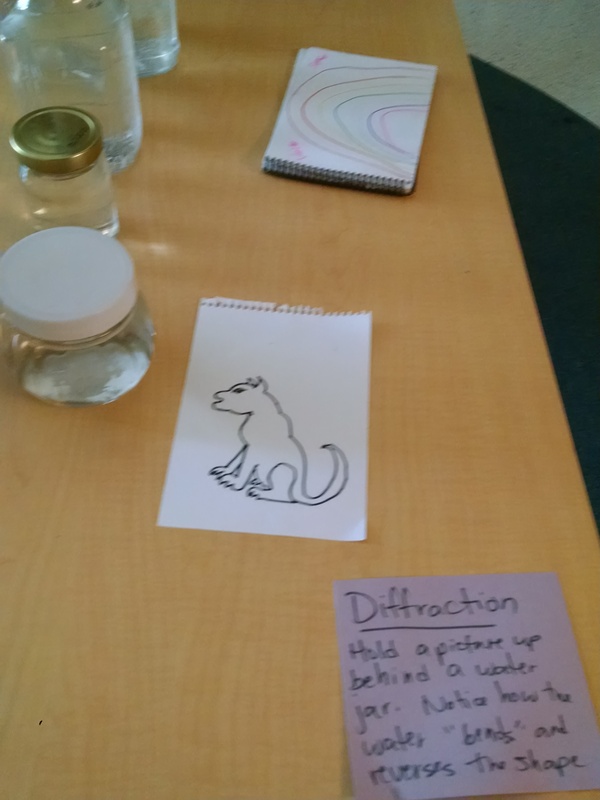 We also do the demos included in the book during circle, and then encouraged them to try out all those same experiments during our “tinkering time” where they return to exploring all the activities, this time with a theoretical framework for what they’re seeing. In closing circle, we read pages 11 – 18 about about daytime and night-time shadows, and pages 21 – 22 which talk about shadow puppet theatre and hand shadows – this prepares us for reading Shadow Night. The surface: You could simply shine a bright light on a wall or a white board, and let your children dance between the light and the wall. But, it’s even cooler if you can see BOTH sides of the surface the shadow is cast on. 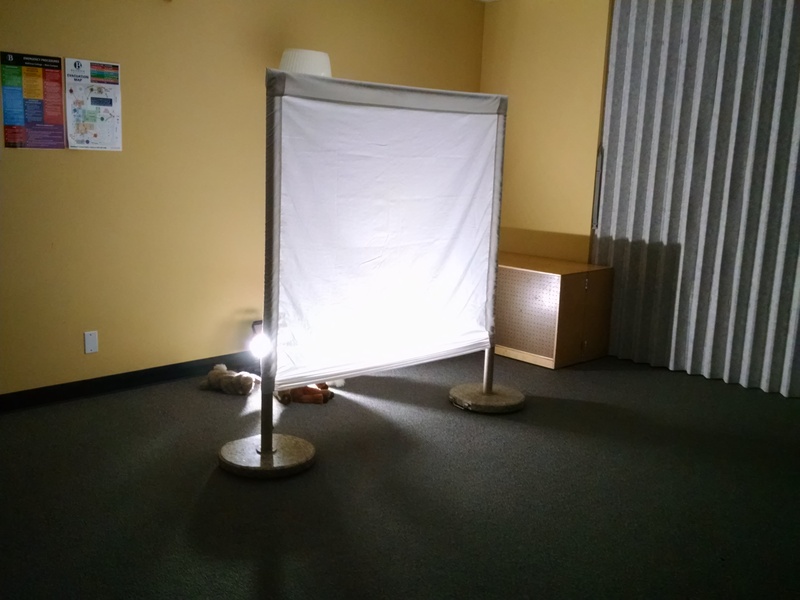 My co-teacher built a fabulous screen of a white sheet supported by a PVC frame. It was held up by two very heavy patio umbrella stands so even with a fair amount of rough-housing, it never came close to tipping over. Alternatively, you could hang a white shower curtain or sheet in a doorway, either with a tension rod, or just taping it above the door frame. The light: Behind the screen, we use an LED Work Light, which is very bright, but cool to the touch. (PLEASE don’t use an incandescent or halogen shop light as they can get very hot!!) We happen to have an interior room with no windows, so it’s easy to get the room dark enough to get good shadow effects – it might be harder in a window-filled room. 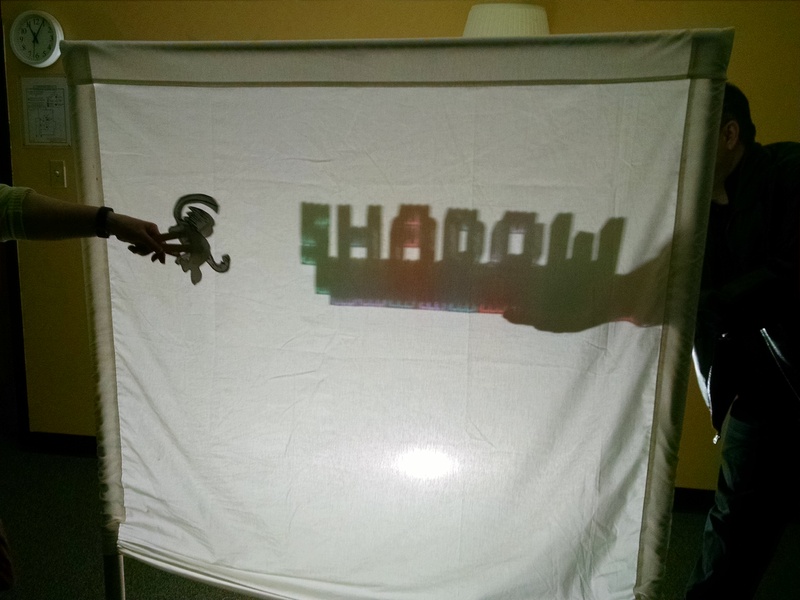 What shadow does it make: Kids are encouraged to bring in other items from the classroom to see what shadows they would cast. I especially love the combinations. Photo 1 shows where they’d placed rainbow colored translucent “Duplos” in front of the light to cast rainbow light, then put a unicorn puppet close to the screen. 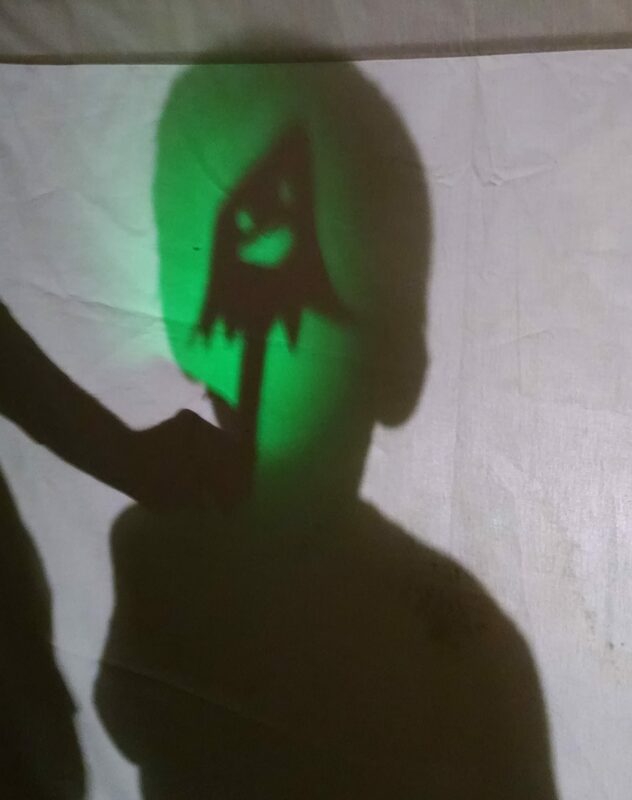 In photo 2, a child is standing in front of the shop light, which casts his shadow, and holding a green flashlight in one hand, shining on a puppet to make its shadow. Photo 3 is a Duplo sculpture made by a dad, and a monkey puppet. Hanging shadows. You could hang a clothesline across a room and hang a lot of items on it. Hand the child a flashlight and turn off the lights – they can walk up and down the line, shining the flashlight at all angles, finding the shadow in the room. 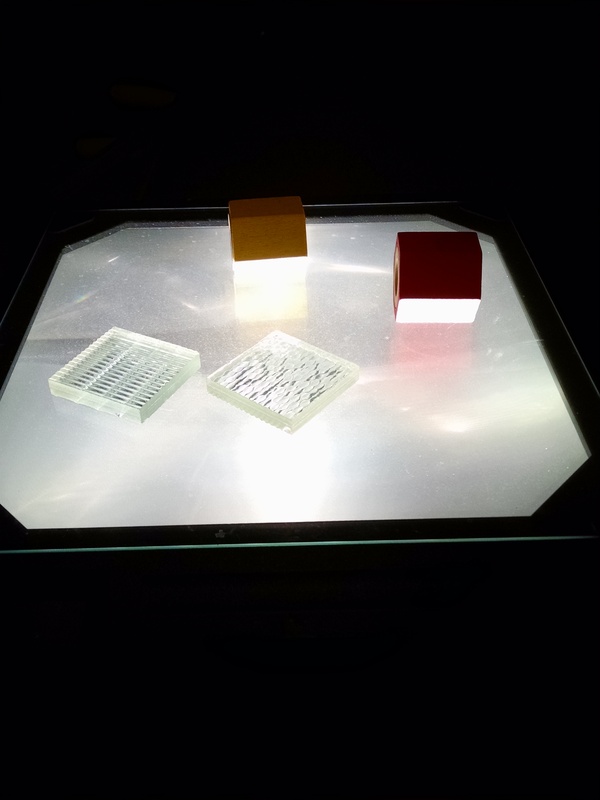 Projector Shadows: We have an overhead projector, so set it out with some opaque items (blocks, etc.) and some glass tile samples that make really cool shadows. 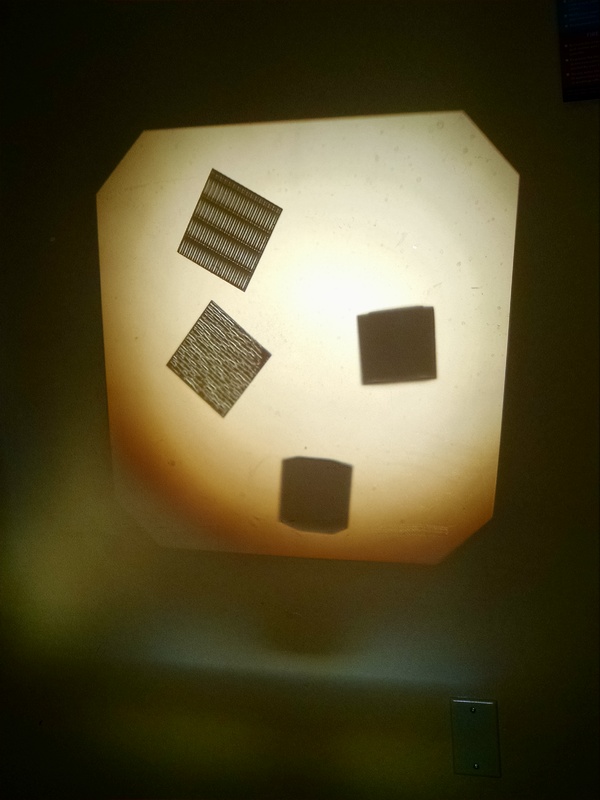 Here’s a picture of the items on the projector surface and then their image on the wall. We use this again in Rainbows week. Challenge of the Week – Engineering Project: Sundial. 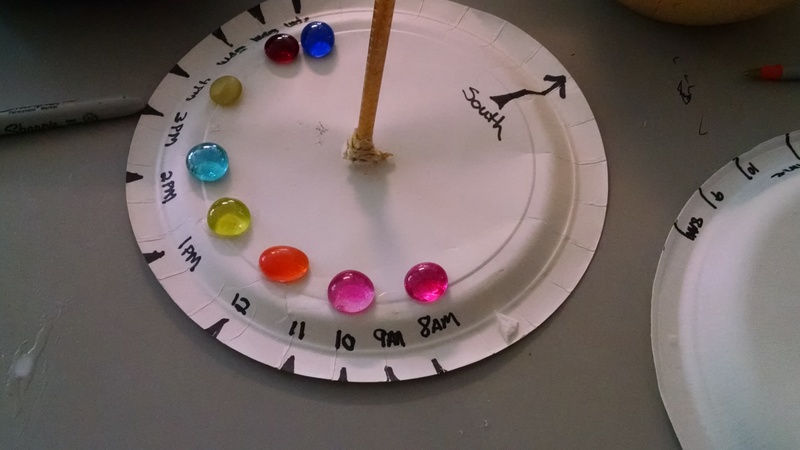 Create a sundial with a paper plate, straw or pencil, tape, glue and glass globules. Since we only have our students for a couple hours, and since the weather forecast in Seattle is often gray skies and rain, my co-teacher preps a template a few days ahead of time (on a beautiful sunny day) and we do a slightly different process. We put the pencil in the center of a plate, then slide on the paper template, which is smaller in diameter than the plates, then the child marks off all the times. Then we remove the templates and they decorate their sundials. We use a flashlight to illustrate how as the sun moves through the sky, the shadow shifts to indicate the time of day. As you can see from the third photo, sometimes we put out the supplies for one project (a sundial) and children do something completely different than we had expected… we’re OK with that. (Our only rule for projects is “Be Creative, Not Destructive”, aka “Make not Break.”) We still showed this child how the shadow would shift as the day went on, landing on different Shopkin drawings at 8 am than it did at 1 pm. Optional Outside Activity, if the sun is shining: Students set-up their sundials in the sunshine and see where the shadow falls – and check whether it’s correct about the time. Laser Maze. We own a great board game called Laser Maze. It’s a Think Fun game, where there are a series of puzzles of increasing difficulty. The child sets up the board as shown on the card, then turns on a laser, sees where it’s shining, and adds mirrors and obstacles to the board to re-direct the light into the goal for the puzzle. Teaches not only the idea of reflecting light, but also a good logic puzzle. Our little kids just dinked around with the pieces, but kids age 5 and up became totally absorbed in working their way through the puzzles. Reflection – Mirror Boxes. 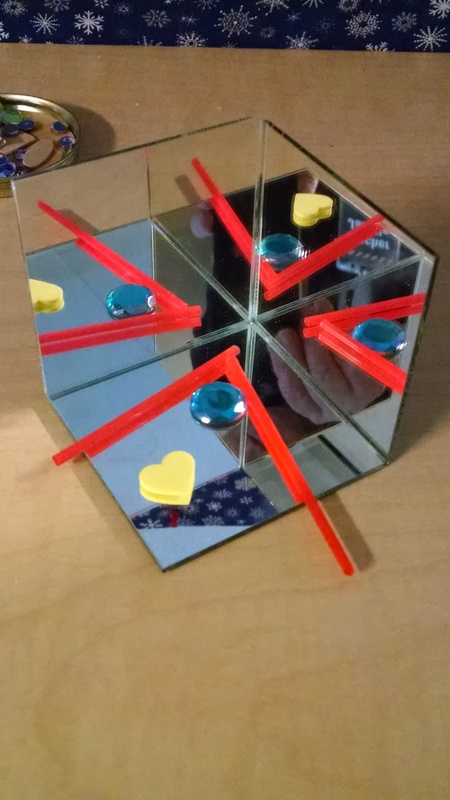 We also built simple mirror boxes (taping together three square mirrors in a half-a-cube shape, and gave kids materials to arrange in there to make symmetrical patterns. Learn more about mirror boxes at Imagination Tree. Building Activity: We have translucent “Duplos”. 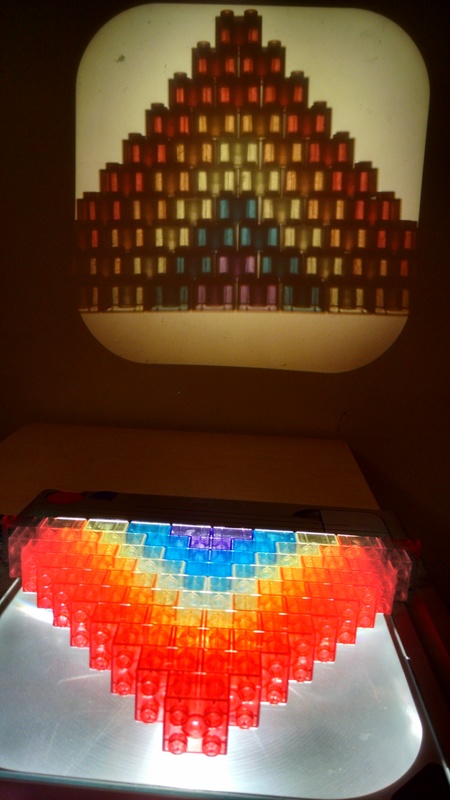 The kids build towers with them, then shine a flashlight to see the colorful shadows. 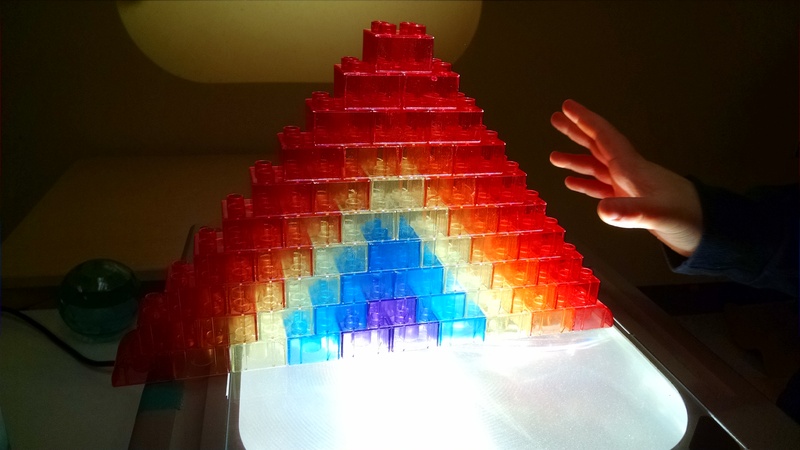 The key to the success of this activity is to just leave the flashlight on, shining through whatever tower is currently there… as kids look over and notice that colorful shadow, it intrigues them enough to come and explore. If the flashlight isn’t on, they are more likely to pass the table by as a familiar “it’s just Duplos” activity. 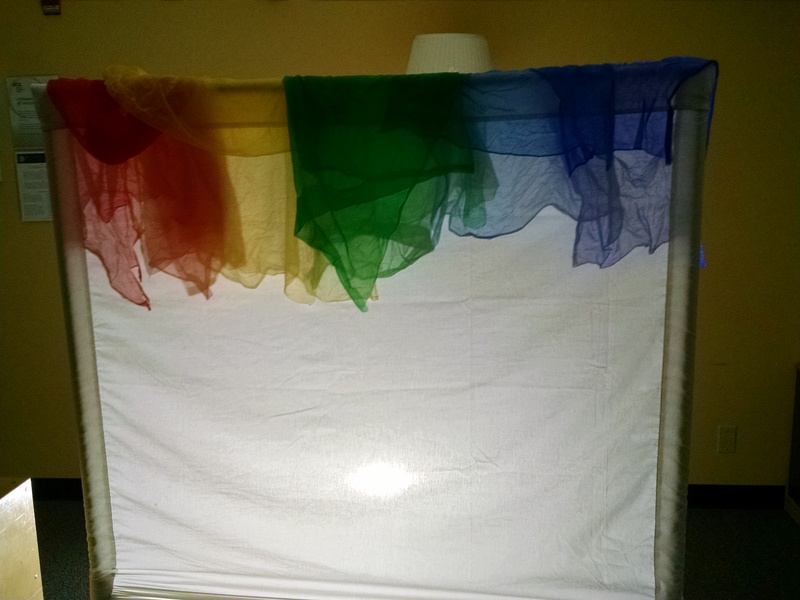 My favorite moment this year was when a kid built a rainbow, and we put it on the projector. Check this out! 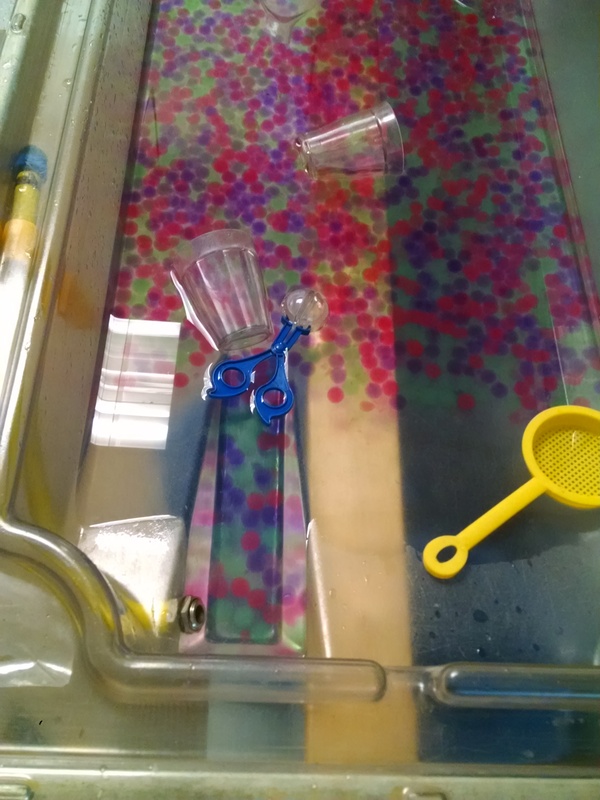 Light Table and Water Table: Some years, we have the light table out with a variety of translucent items for free exploration and, separately, the water table filled with colorful water beads floating in water, and a couple flashlights to shine on them, to shine up through the bottom of the table. Other years, we put the light table under the water table to shine up through there. and put all the translucent items in the water. 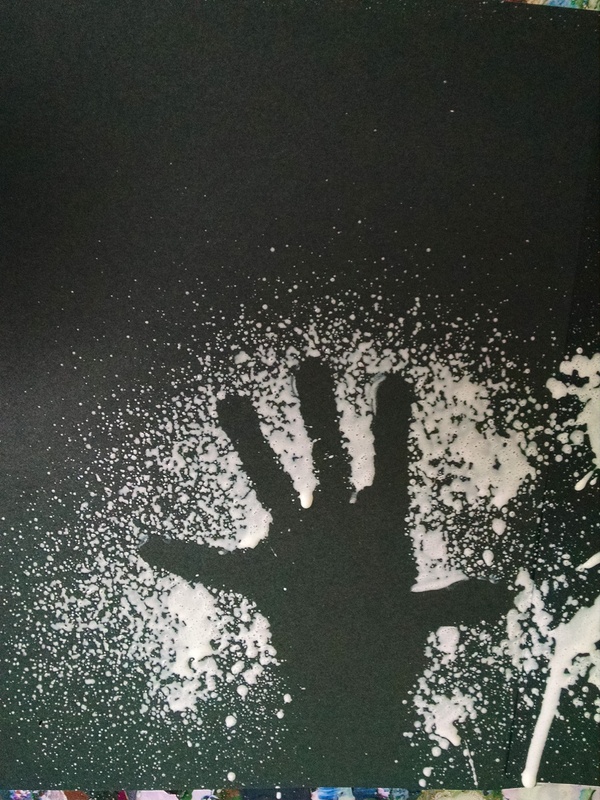 Basic idea: A child lays their hand on a piece of paper, with fingers spread wide, and you spray paint on to it. (Tell them this is like sunshine shining on their hand – the light rays will spread outward and continue till they run into something that blocks them, and that makes a shadow.) When they lift their hands off, a shadow is left behind. Here’s a poster to explain the idea… The poster also includes photos of several ancient cave paintings of paint shadow hands, including some from Indonesia believed to be 40,000 years old. Logistics: We filled a spray bottle with white kid-safe / easy clean-up paint mixed with water… the goal was to thin it enough that it would spray easily and not clog the sprayer, but not so thin that it would run. You can either put a piece of paper on the easel, and this is a take-home project OR you can cover a whole table with paper and do a group artwork. 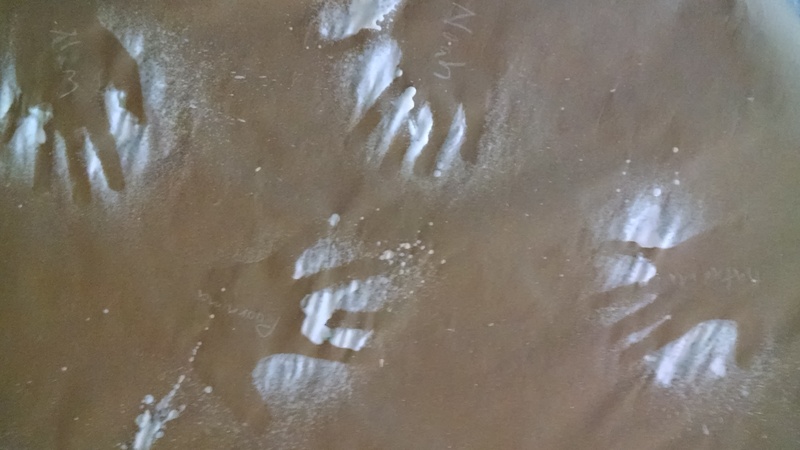 The first year, we’d planned for the kids to do the spraying themselves (good fine motor practice) but with our sprayer, if you were too close to the paper (i.e. kid’s arm-length away), the paint stream was too focused. You had to stand back a few feet to get a nice spread-out spray of paint – and no kid could stand that far back and not make a big mess! So, we now just have an adult do the spraying. Have a tub of soapy water and a towel right next to this project so they can wash their hands right away. 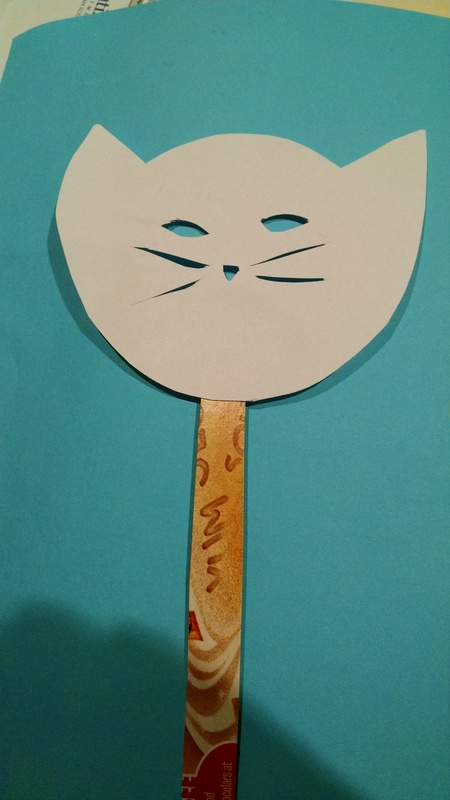 This activity is best for 6 – 7 year olds. The younger ones have a harder time figuring out how to make a three dimensional sculpture. 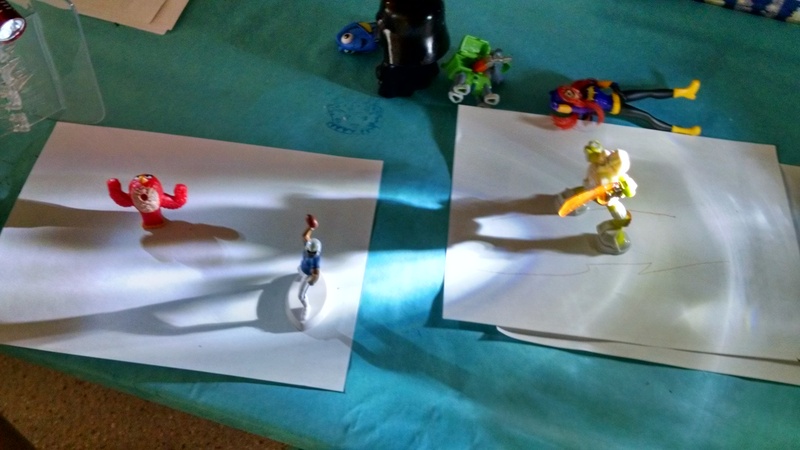 If you’re working only with little ones, you might find it better to just use plastic toys / action figures and have them trace and color in their shadows on paper. 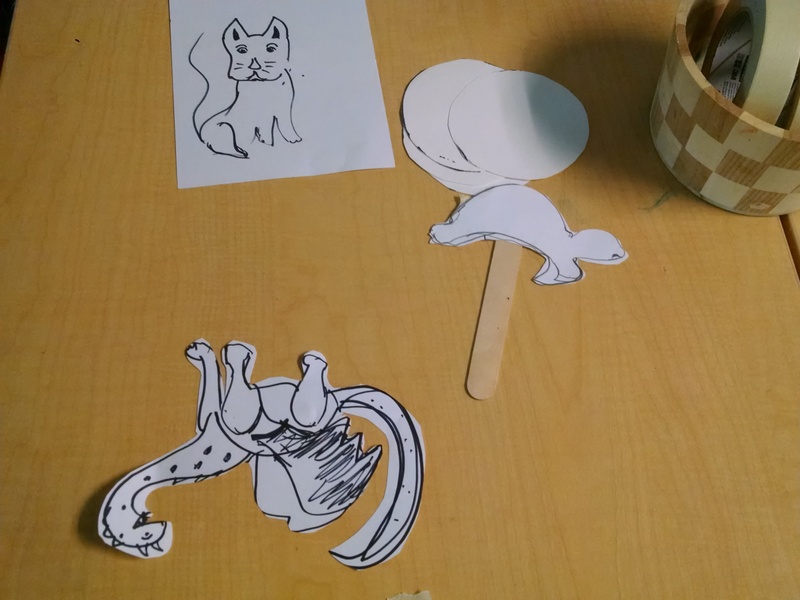 I prefer the sculpture activity where they go home with BOTH the shadow tracing AND the sculpture it’s based on, but for little ones, it was just too tricky. If you use toys, be sure to choose ones that make fun shadows! Mural of kids’ shadows. You could tape a big piece of paper on the wall. Then shine a big light or projector at it. Have kids stand by the wall so their shadows fall on the paper. Trace their shadows. Silhouettes. Put paper on wall. Have the child sit sideways in front of the table. Shine a bright light on them and trace their silhouette. I recently had a conversation with someone about how this was a “thing” in the 60’s or 70’s, so all of us who were kids back then remember having a silhouette of ourselves. Summer Activity: Sunprints. You can purchase special photo-sensitive paper (called sun prints, or Sun Art Paper.) You set it outside in the sunshine, with various items on it for a period of 15 minutes to a few hours (depending on the product and how bright the sun is), then you remove the items. and you’ve captured the image / shadow permanently. (See example here.) They’re really VERY cool – I love them. BUT… in the Pacific Northwest, I find that they don’t tend to work most of the year – our winter sunlight just isn’t intense enough. I have gotten them to work on very sunny summer days. This is how we did it last year, before I wrote the book we used this year. 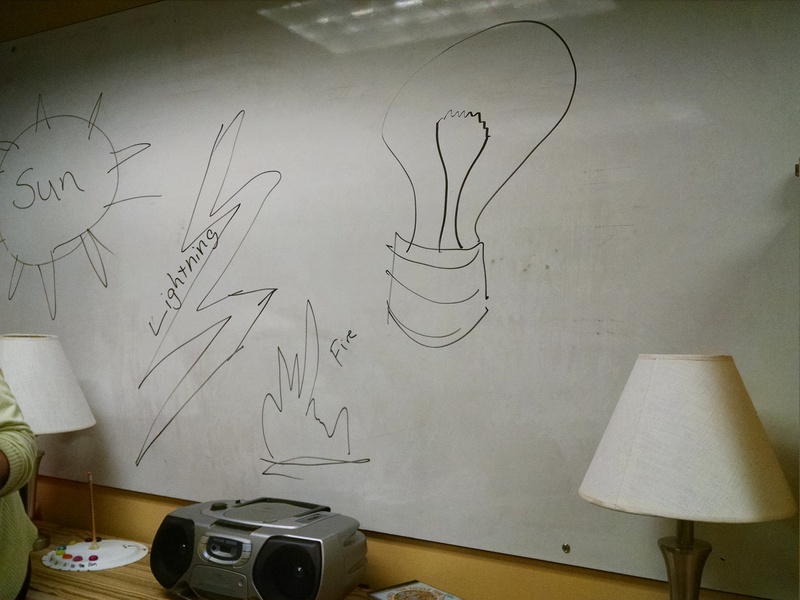 We asked the kids what makes light – what light sources could they think of. As they suggested them, we drew them up on the board to reinforce what was said. We demonstrated a few light sources, including a flashlight that created a very diffuse light and a laser pointer which created a very focused light. We then talked about shadows and when they see them, and what makes them, and so on. We demo’ed some hand shadow puppets on the screen. 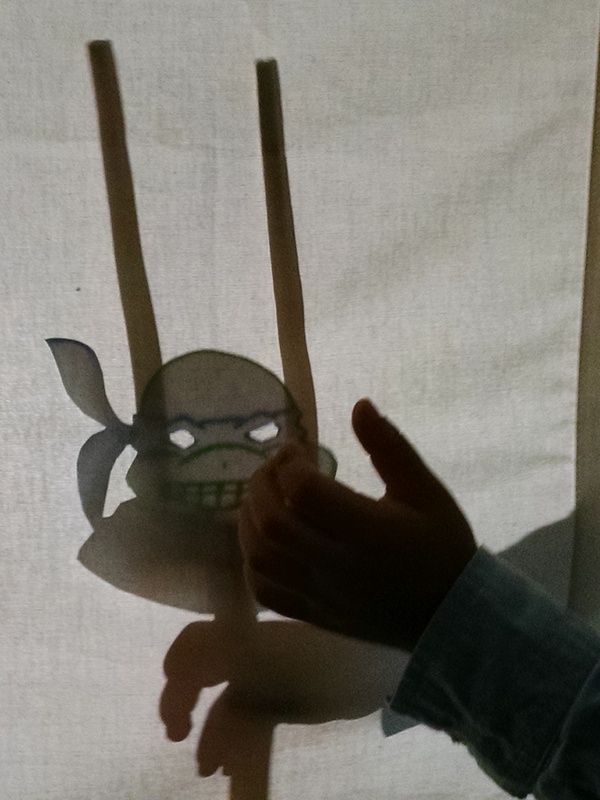 We did a little mini puppet show with some paper shadow puppets. 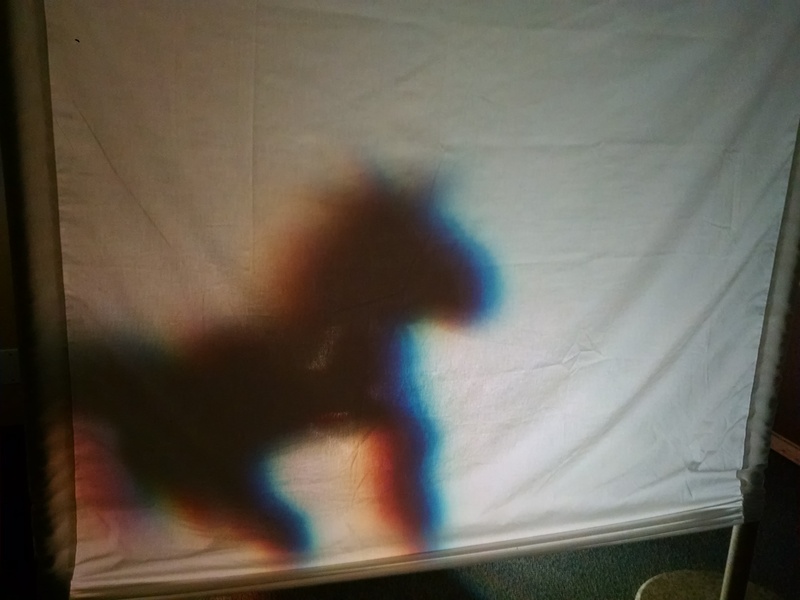 We talked about the difference between Opaque Shadows = No light getting through and Translucent shadows = Some light shining through, and demo’ed this with some colorful scarves and the translucent Duplos. Song – We’re still looking for a great sing-along about light or shadows for circle. A couple options, both to the tune of Frere Jacques (Source 1; Source 2), and my variant. Have the kids mimic the shadow shapes as you sing about them..
On the wall, In the hall. Some are small, Some are tall. Shadow Night by Chorao. A boy sees shadows on his wall and is afraid that they are monsters. He yells for his parents, who come to reassure him, and end up showing him how to make shadow puppets with their hands, and then they tell a story with shadow puppets. The great part is that the book is also a tutorial in how to make those hand shadows yourself!! So, one teacher read the book where the kids could see it, and the other made the shadows on the screen for everyone to see. 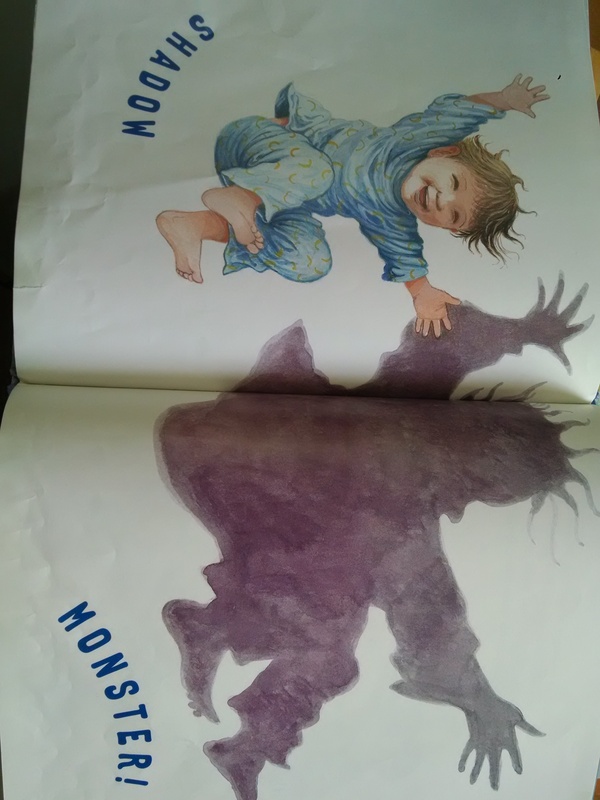 The book ends with the boy making shadows on the wall, including a shadow monster. Ages 3 – 7. Although it’s long for a read-aloud, it works, when used in conjunction with the shadow screen. Moonbear’s Shadow by Asch. When Bear is fishing, his shadow scares away the fish. So, he tries to run away from his shadow and tries to trap his shadow, but with no success. At noontime his shadow disappears so he takes a nap, but in the late afternoon, it’s back! But when he goes fishing, his shadow no longer falls over the water. So, he catches a fish – and so does his shadow! A cute story for ages 3 – 5 that also discusses how shadows change as the sun moves through the daytime sky. The Dark, Dark Night by Butler and Chapman. Frog is headed home to his pond after dark and borrows a lantern. When he gets to the pond, he sees a huge black Pond Monster! 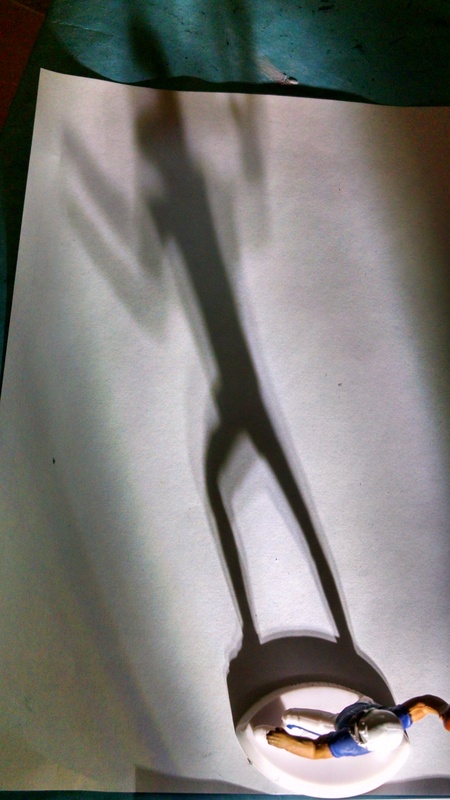 (The kids in our class were delighted that they all knew this was Frog’s shadow, even though Frog didn’t know that.) He goes and gets friend after friend. They see bigger and scarier Pond Monsters and get more and more worked up. Then at the end, they realize that it’s just their shadows and laugh and laugh. 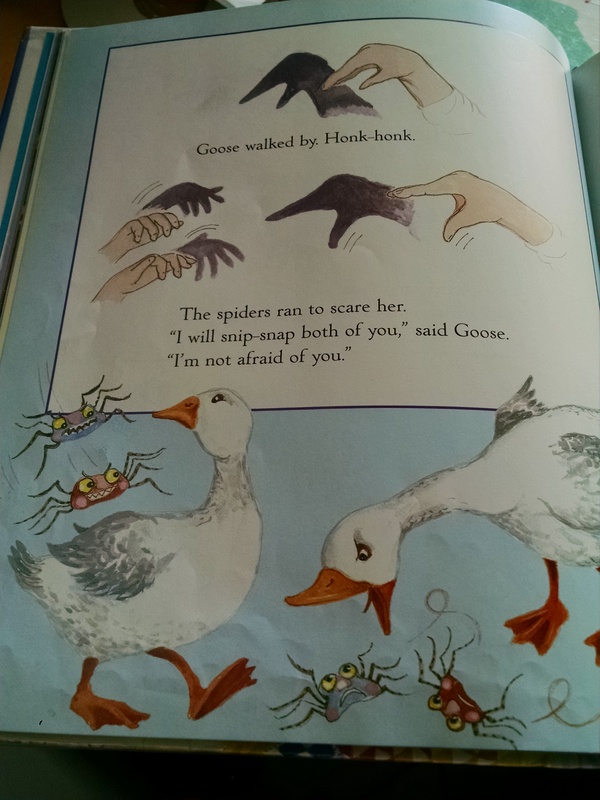 A nice story about shadows and also about how sometimes a misunderstanding can lead to fear and then when we learn more it becomes less scary. Fun for ages 3 – 6. Lights Out by Medearis and Tadgell. Part of the Just for You series featuring African American families. Nice illustrations, good rhythm and rhyme to the text. “‘Good night, sleep tight!’ Daddy tucks me in. Out go the lights. Now the fun begins!” Sweet story of a daddy tucking a child in to bed, then her sneaking out to look at the city lights and make hand shadow puppets and then sneak back into bed. Nice preschool read-aloud or easy read for a new reader. Nothing Sticks Like a Shadow by Tompert and Munsinger. Age 5 – 7 – a much longer book than I would read at story-time, but might work well one on one at home or as a naptime read at a preschool. Fun, silly story about a rabbit who tries lots of ways to escape his shadow – leaping away, sweeping it away, pulling it off, cutting it off…. My Shadow by Stevenson. This is a poem from the late 1800’s by Robert Louis Stevenson, and many illustrated versions exist. Some of the words are dated: “he stays so close beside me, he’s a coward you can see. I’d think shame to stick to nursie as that shadow sticks to me!” but overall, still appealing to modern preschool-aged children if the illustrations appeal. Oscar and the Moth: A Book About Light and Dark by Waring. This book is a conversation between a cat and a moth that explains how the earth rotates and that causes day and night, explains that light can come from the sun, the stars, electric light, and animals that emit light. It also explains that shadows happen when something blocks the light. A nice overview of lots of scientific ideas, told in a way that not only makes sense to preschool age children, but is engaging as well. Follow It! 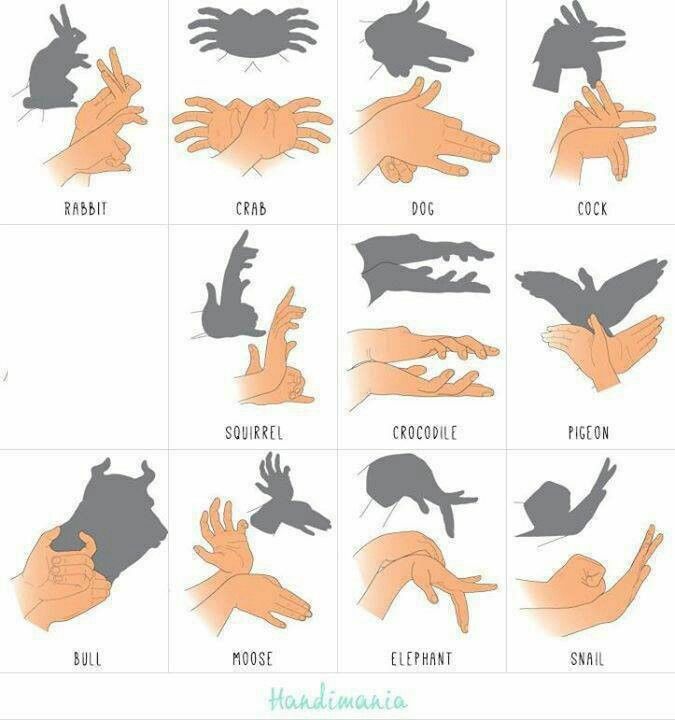 : Learn About Shadows by Hall. Non-fiction, covers all the basic ideas about shadows. Does a great job of gathering the key ideas about shadows, but the writing isn’t very engaging. Good resource for ages 4 – 6. Guess Whose Shadow? by Swinburne. Pros – the book includes a basic introduction to the idea of shadows, with photos to illustrate the text, then it has a guessing game, where you see the shadow on one page and it asks you to guess whose shadow it is, then reveals the answer on the next page. 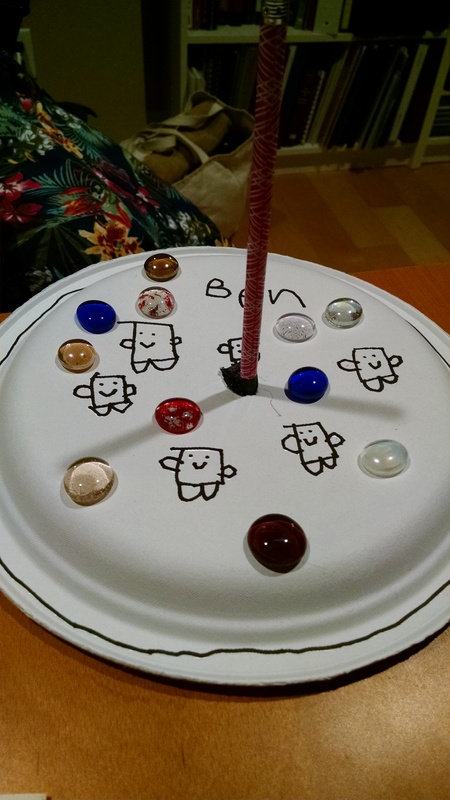 The kids in our class (age 3 – 7) were definitely engaged in the guessing game during circle. Cons: the photos are a little dated, and not that great, and there’s just a grammatical incorrectness to showing a picture of a shadow of a swing-set and saying “guess whose shadow.” It’s almost tempting to write / photograph our own version of this guessing game. Shadows and Reflections by Hoban. 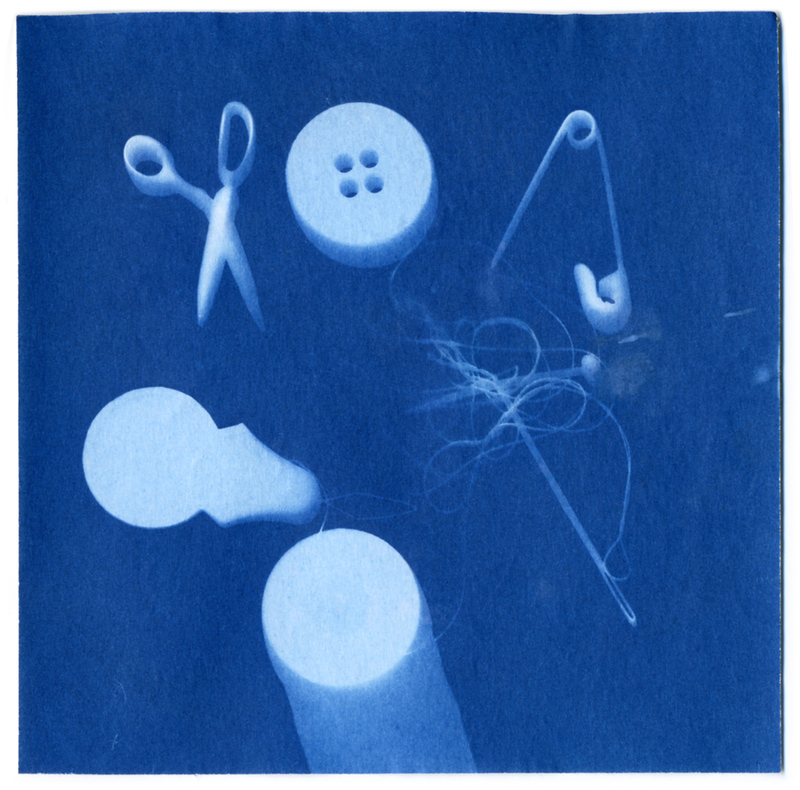 Like all Tana Hoban books, this is a wordless collection of photographs on a theme. Like all Tana Hoban books, I think this one is fine, and I get it to put on the bookshelf for kids to look at it, but I can’t say I love it. What Makes a Shadow? by Bulla and Otani. A really nice non-fiction overview of everything having to do with shadows. Great for 5 – 7 year olds, or to read one-on-one to a younger child, but too long for a group time with preschoolers. Day Light, Night Light: Where Light Comes From by Branley and Schuett. Branley worked at the Hayden planetarium and has written many kids’ science books. Like his other books, this is a really good summary of the scientific facts, for kids 5 – 8. We don’t read his books in class because they’re too long and over the heads of half our kids, but they’re quite good. Watch Grover from Sesame Street sing about his Furry Little Shadow. 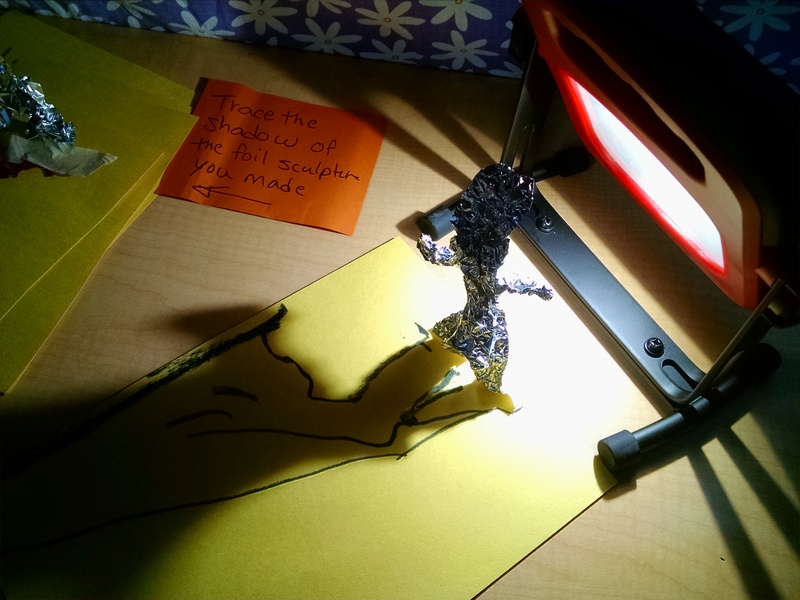 Make a shadow puppet theatre using a cereal box and either waxed paper or printer paper. 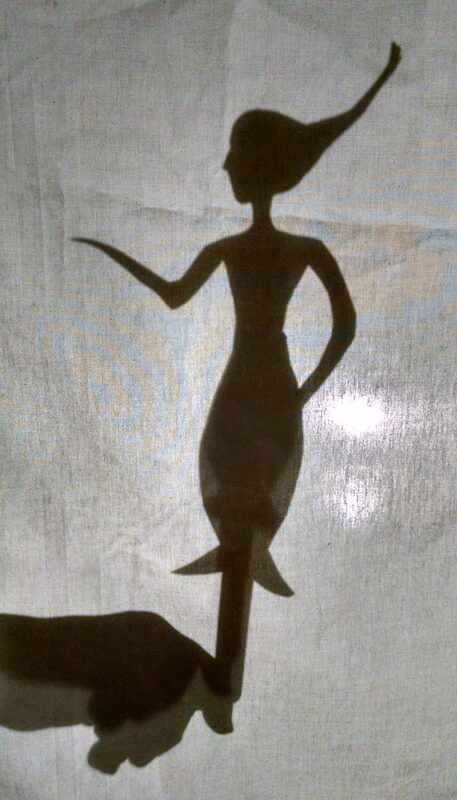 There are great how-to tutorials both at Jimmie Lanley’s Hub Page (which also includes links to other info about shadow puppets) and on the website for Kix cereal. For a great tutorial on all the steps to creating a puppet show (writing or choosing your story, finding images for characters and props, making your puppets, building a screen, rehearsing and performing), see My Kids Adventures. It also includes a link to a ten minute documentary on traditional Chinese shadow theatre. 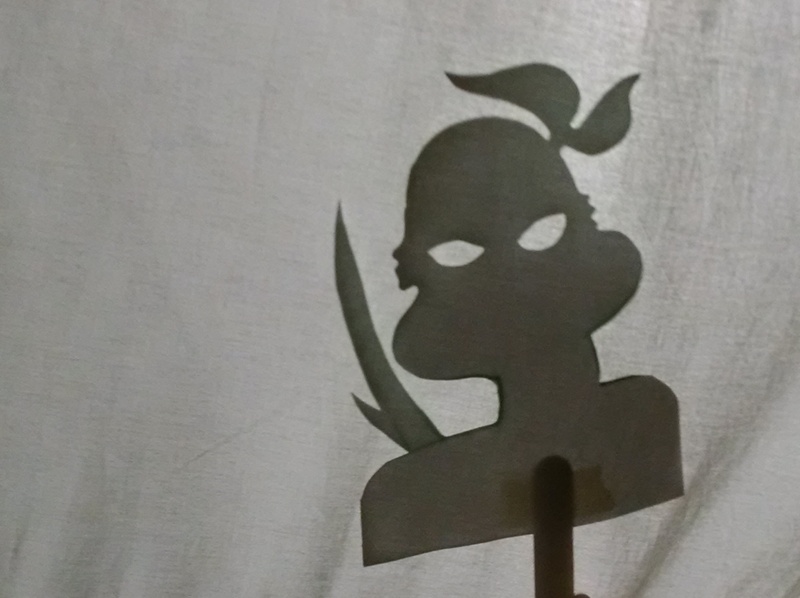 More info on shadow puppets at Coolest Family on the Block. These are all such wonderful ideas! Thanks for inviting me over to take a look! Hello! 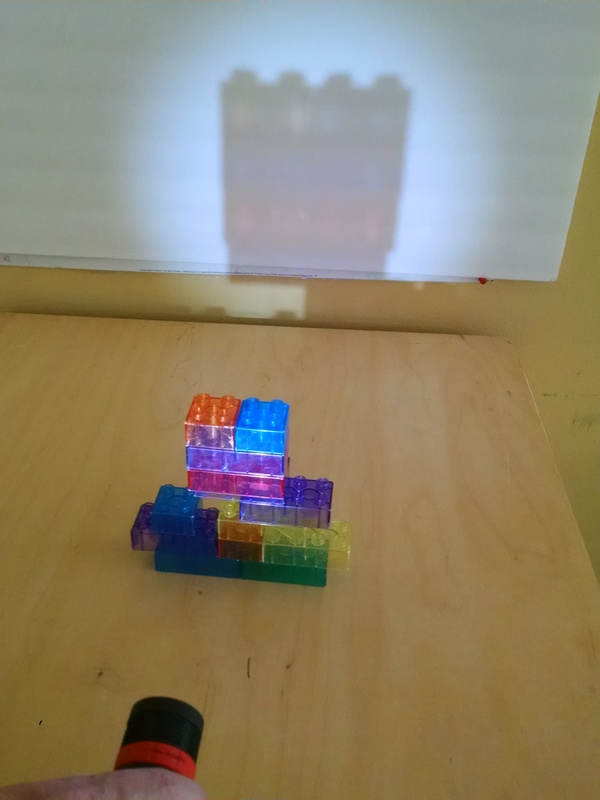 For one of my classes, I am teaching a group of students about light and shadows and love the building activity:) Where did you get the translucent duplos? All interesting for kids, I enoyed looking through this site.